Computers have various types of ports. Ports for connecting keyboards, printers, mice and other equipment. So what happens when you need a PS/2 connection but only have a USB port? 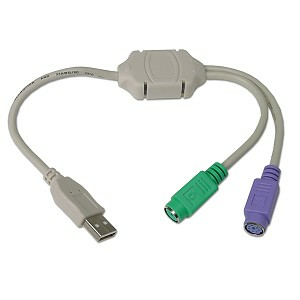 By simply attaching this terrific converter you can use a USB port as a standard PS/2 port. This will come in handy if your mouse, keyboard, or other equipment only offers a PS/2 connection, or if you own a newer PC that doesn't have a PS/2 port.